New Hampshire has some of the most scenic views in the country. Throughout the forests of New Hampshire, you'll encounter remnants of towns from former days, now obscured by trees and undergrowth. Once this area was eighty percent cleared land, much of it in cultivated fields, pasture and farmsteads. All that’s visible of most of these earlier settlements or "ghost towns" are cellar holes, stone piles, apple orchards, stone walls and old gravestones. Traces of roads remain as hiking trails. Hiking in New Hampshire can lead to all kinds of exciting discoveries. Many of the former town sites are situated on White Mountain National Forest land and administered by the U.S. Forest Service. With a number of them near hiking trails, you can discover remnant sites and explore the ghost towns where farmers and loggers once lived. In the present town of Woodstock exists one of these old White Mountain settlements, a mere "ghost" of a once thriving village. Mt. Cilley, sometimes called Peeling, has returned to forest, but a few remains of the 19th century village still exist (cellar holes, old stone walls, culverts, stone piles) and generally are visible to the hiker who explores the Mt. Cilley Trail. You'll have about a four mile trek from the trailhead at U.S. Route 3 (south of North Woodstock village) to the last farm on Mt. Cilley. You also can reach the old Mt. Cilley Road from Route 118. About one and a half miles from Route 3, old stone walls become visible on both sides of what was once the village street of this deserted village. However, cellar holes, tumbled inward and somewhat overgrown, exist, along with culverts if you can find them under the vegetation. The path continues along the old village street, descends through evergreen woods and crosses a brook. In less than one mile, shortly before the road turns, the path passes through a section that might have been the old village square, a design typical of New England towns. 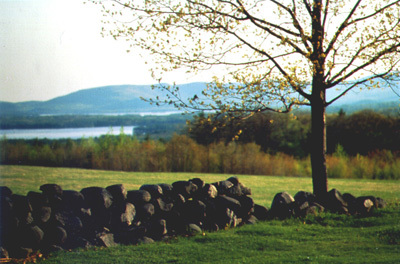 A remnant of one of New Hampshire's old stone walls. A number of farmers, a shoemaker and the sawmill owner lived here. They raised Indian corn, wheat, oats, Irish potatoes, hay and cattle. They made cheese, butter and maple syrup. There was a school in the settlement, and reportedly 40 pupils attended in 1840. Apparently there was no church building at Mt. Cilley, so the parishioners met in the school or private homes. Many of the settlers came to Mt. Cilley from southern New Hampshire where they were friends and neighbors. This settlement in the central part of the state, included 15 families in the 1840s. During the 1850s, Mt. Cilley began to decline. Some of the settlers grew older and decided life in the now larger towns of Woodstock and North Woodstock would be easier. Those with children moved to the valley to be closer to neighbors, school, church, and the advantages they thought a larger town offered. By the end of the Civil War, the area was no longer farmed, although it was pastured until the end of the century. Then in 1916, this land around Mt. Cilley was purchased by the U.S. Forest Service and now is reached by hikers who enjoy the forests and those interested in New Hampshire history seeking the ghosts of the past. Consult the "A.M.C. 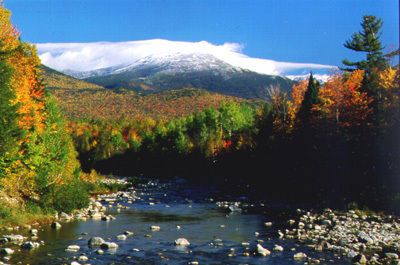 White Mountain Guide" for information of interest to hikers and a brief overview of the area. 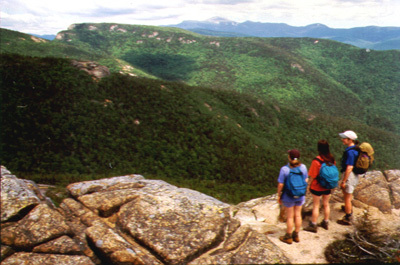 Check with the White Mountains Attractions Association (www.visitwhitemountains.com) in North Woodstock, NH for hiking and other information of this area.